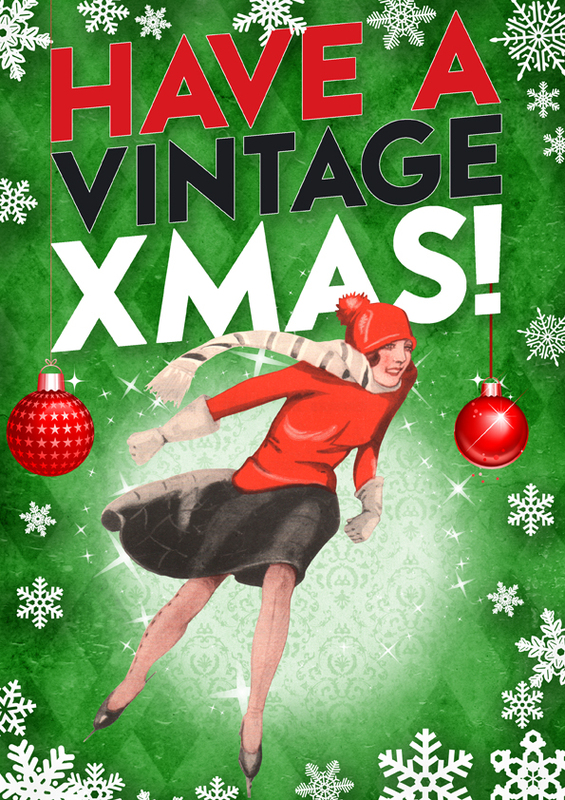 Hope everyone has a fantastically vintage time! 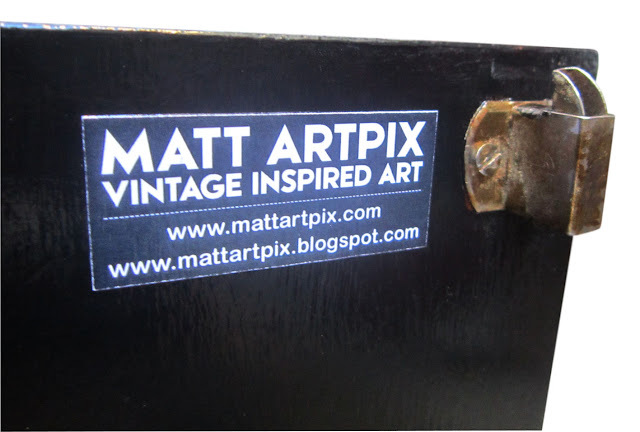 I've been busy plundering the ArtPix Archives for more images to use on my popular retro collages. I dug out loads of magazines from the 50s and 60s and found some corkers tucked away! 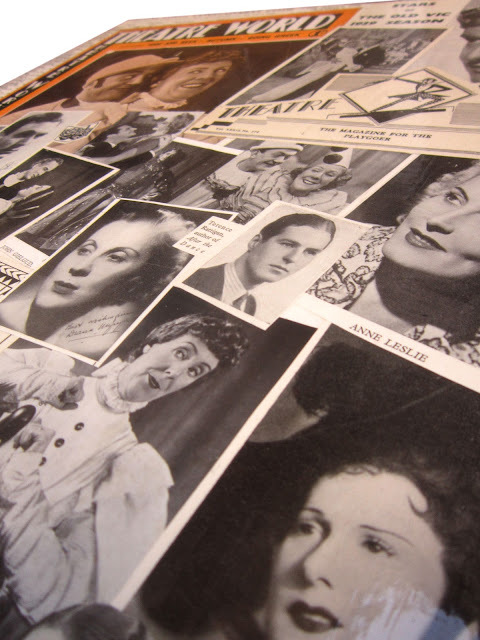 Especially some famous faces in their very early days! 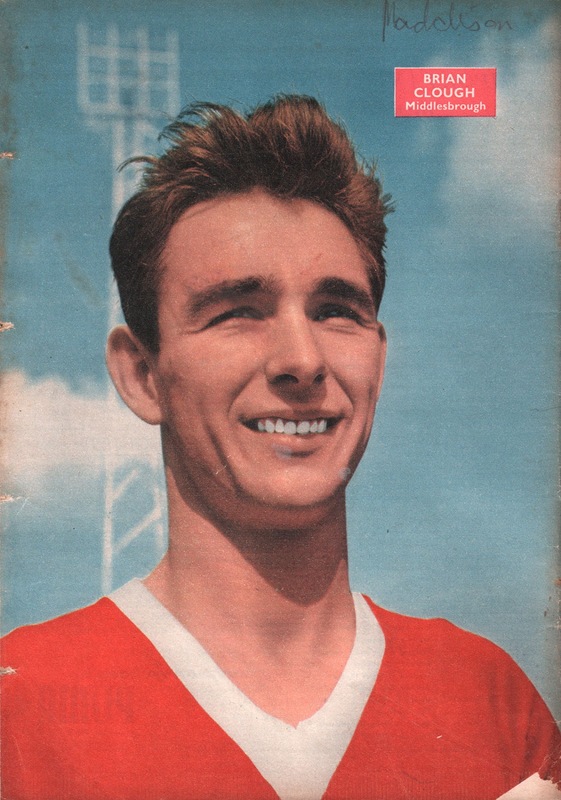 Brilliant picture of the irrepressible Brian Clough, seen here in his playing days at Middlesbrough, as a prolific striker in 1958. 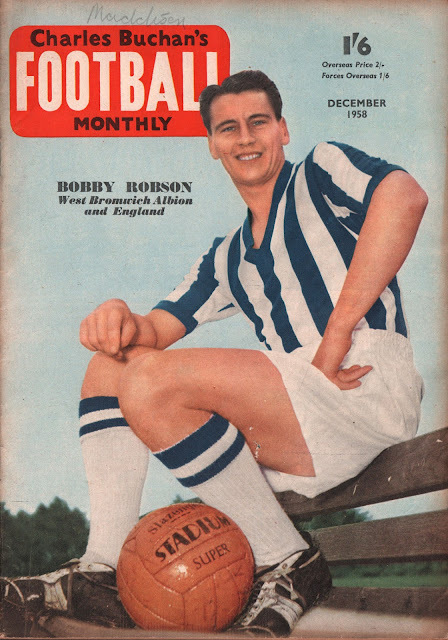 Future England manager Bobby Robson, also in 1958, when he was a forward with West Brom. 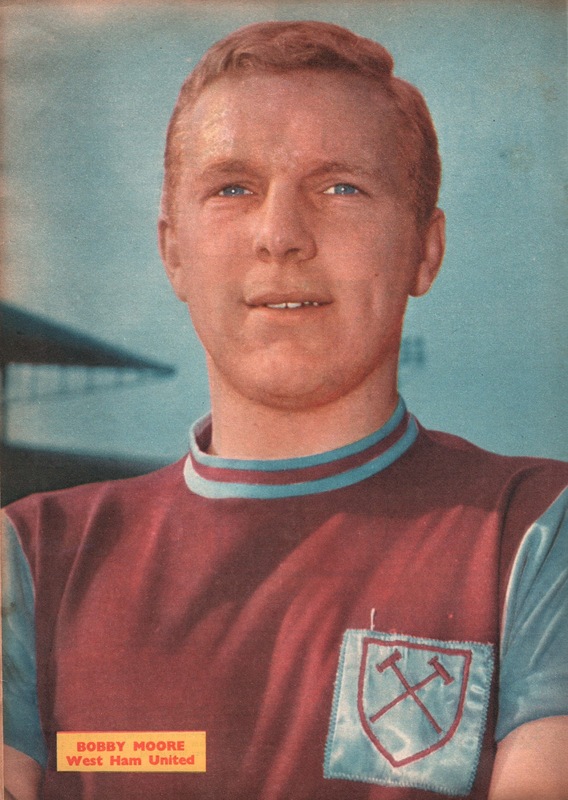 Cracking picture of a young Bobby Moore in 1961. Five years later he would captain England to the World Cup. Issue No. 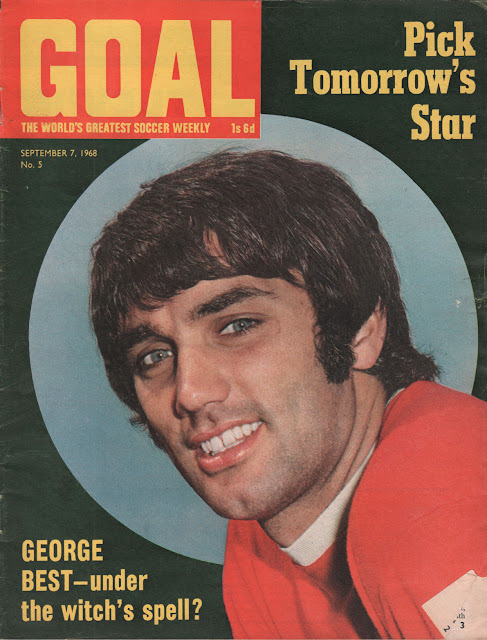 5 of Goal magazine featured this portrait of Manchester United star George Best. I also found some useful images for teams I'm thinking of doing as collages, to add to my long list. 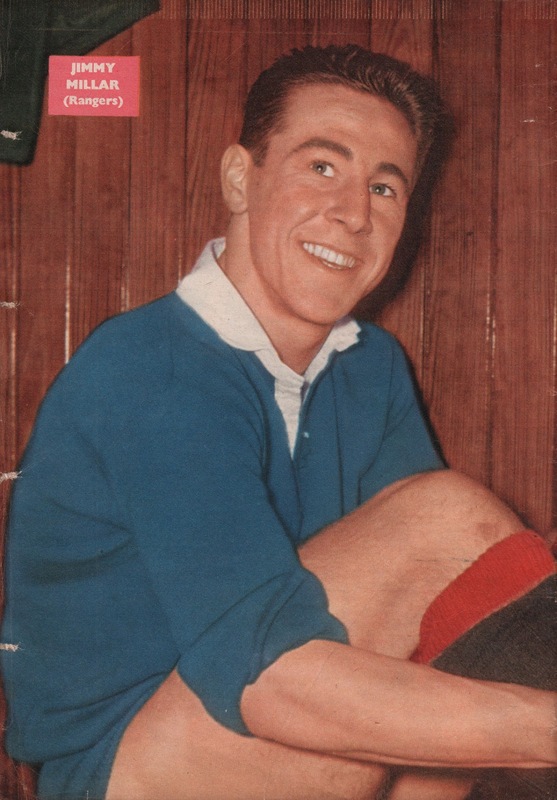 Jimmy Millar, who turned out for Rangers throughout the 1950s. 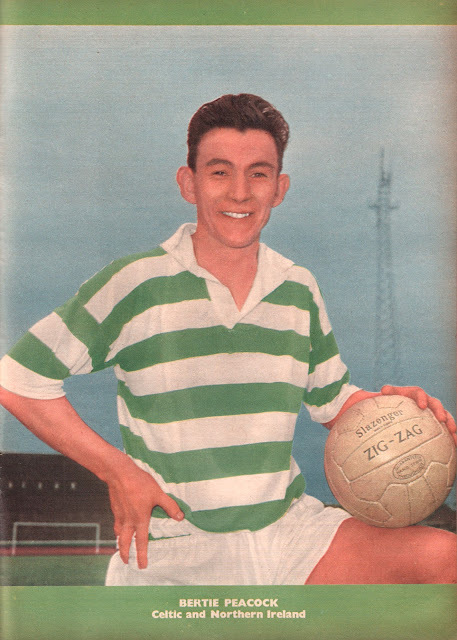 Another star of the 1950s, Celtic's Bertie Peacock. 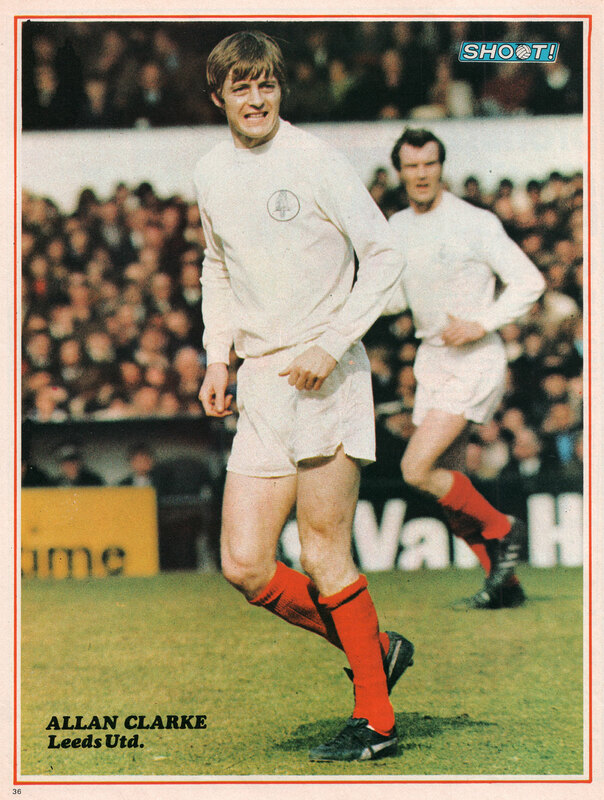 'Sniffer' Clarke from the legendary 60s and 70s Leeds team. Forest's winger Stewart Imlach, who played in their FA Cup winning team of 1959. Can't wait to get started on these new collages now!! I love it when the mainstream dips its toes in to the world of Alternative Music. This week on BBC4 there was a documentary on one of the finest bands you've probably never heard of. I imagine a lot TV listings writers frantically Googling the name of this band and panicking at their image, and simply not knowing what on earth to make of them. The band in question are LAIBACH. Emerging in the Tito-era Yugoslavia of the early 80s, this band have trodden their own path ever since. I can't really put into words how important and how amazing they are, just check them out. I first came across them by accident way back in 1987, seeing a video of their immense version of Life is Life by cheese-rockers Opus. I've been fascinated by them ever since. They have created a whole universe of music, art, culture and much more. 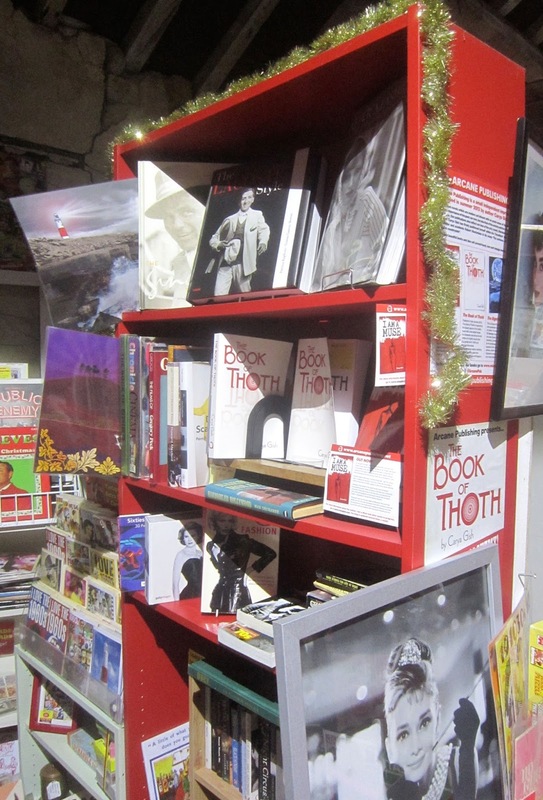 AND they have the most impressive merchandise stall of any band I've seen! 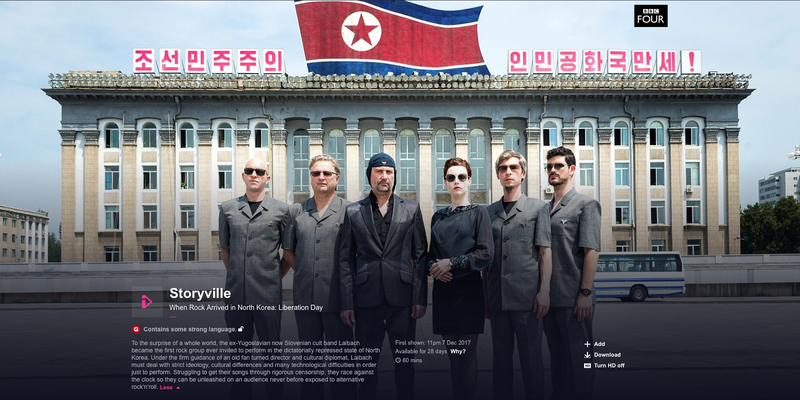 The documentary shown this week is of their extraordinary trip to North Korea, to become the first ever band to play Alternative Music in the secretive Communist country. 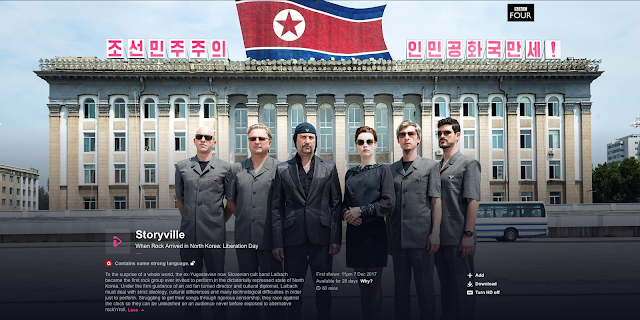 I can't imagine what the Koreans thought Laibach were all about, I presume they thought they were fellow Communists, but it's a dangerous path to try and pigeon-hole this band into any given category!! But I think it's fitting that it was Laibach who were the trailblazers. Have bunged some new goodies in my unit at The Customs House in West Bay, Dorset! All are fantastic Christmas pressie ideas!! Here is the front of the unit, the blue table is actually for sale as well, see further below for more details! 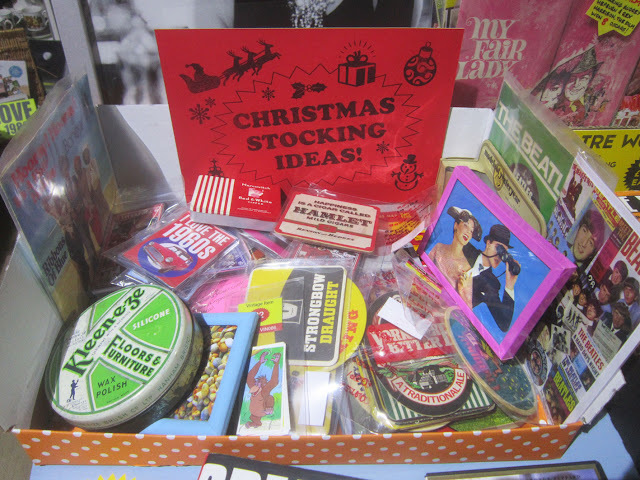 This is a specially created box packed with small items, perfect for Christmas stockings! 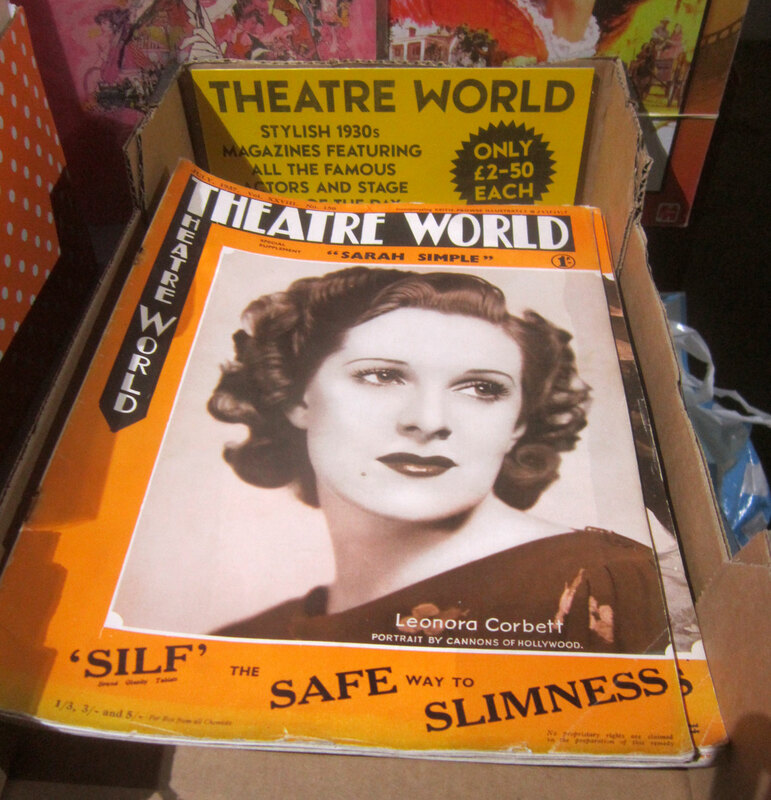 A box full of the delightfully Deco Theatre World magazines from the 1930s. A look at some of Arcane Publishing's mix of carefully selected vintage books and novels written by Carya Gish. 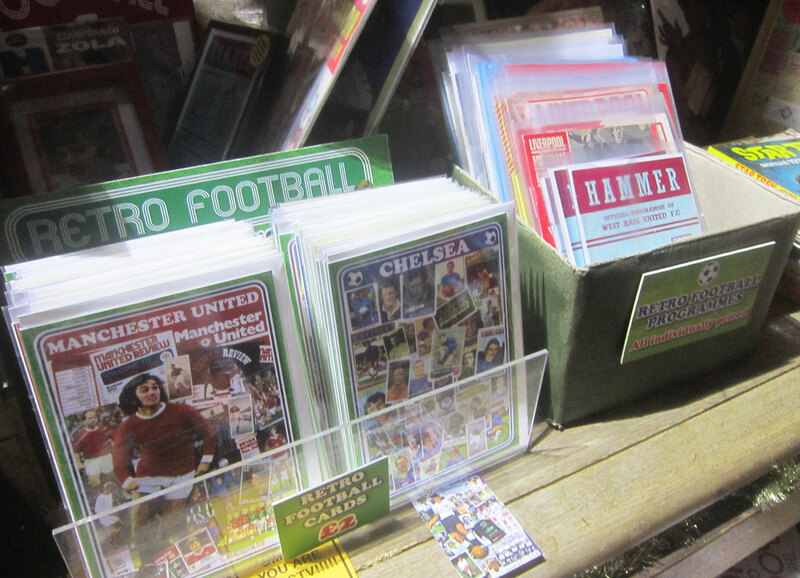 As always I have a fine selection of Retro Football stuff, these are my own designs on cards and a box of football programmes, which all come with a written description of the match. 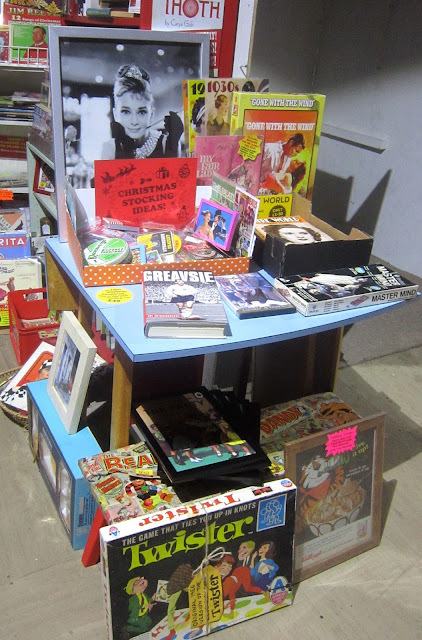 As promised, here is the table that's for sale! 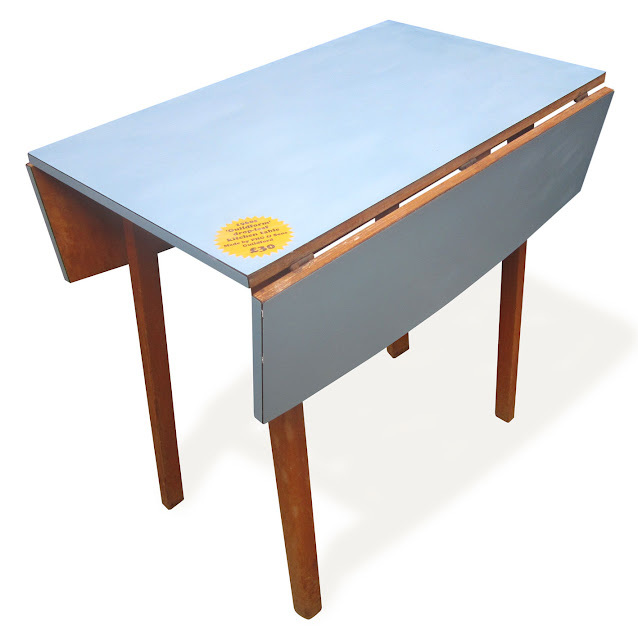 Its a fab 1960s 'Guildform' drop-leaf kitchen table, made by PHG & Sons of Guildford. They go for a song online, but this one is a snip at £30!! 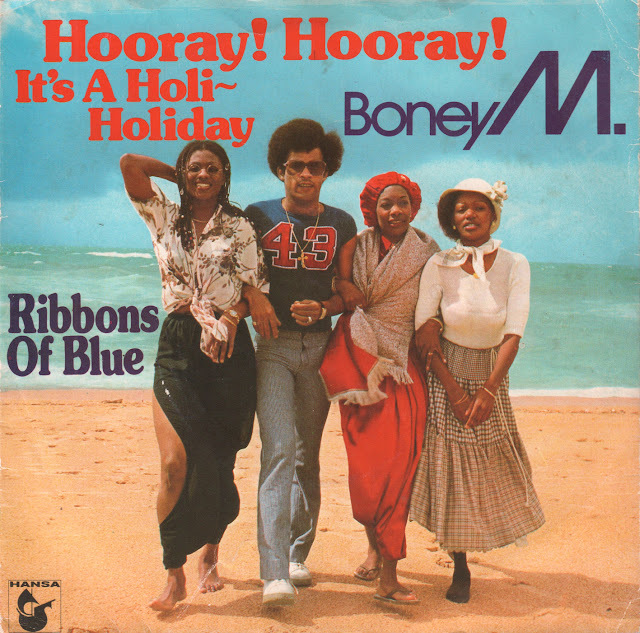 Bit of holiday fun here, the classic Boney M single from 1979! 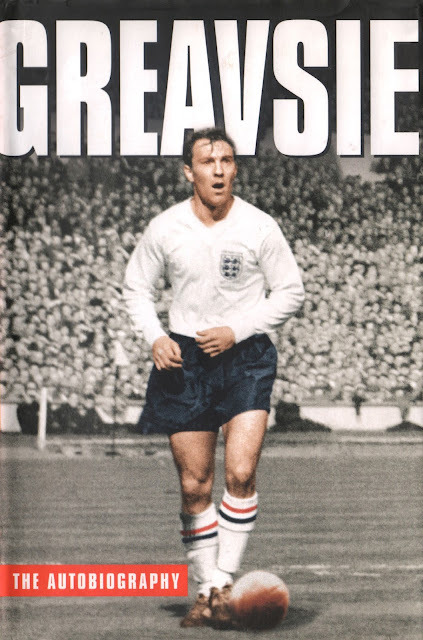 Autobiography of the legendary striker Jimmy Greaves. 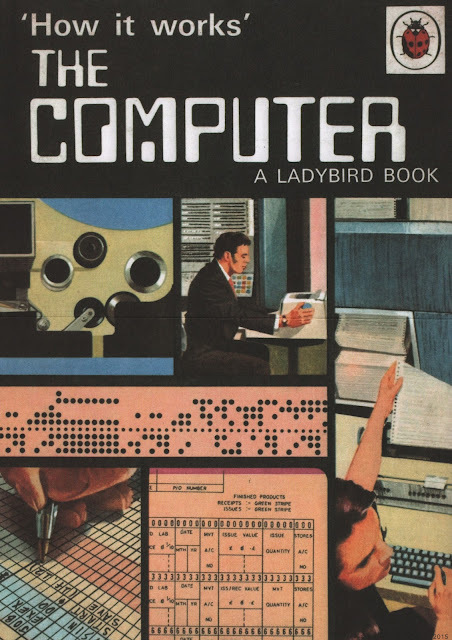 This is a 1st Edition of his 2003 book. 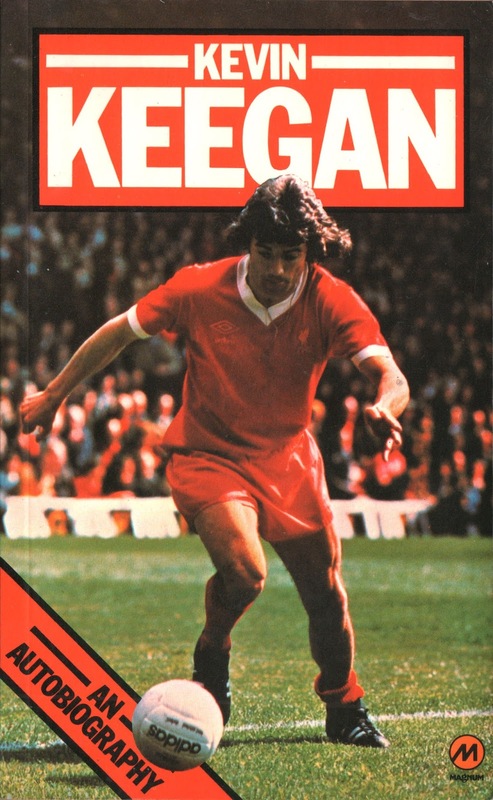 This is Kev's autobiography from 1978, a must for any Liverpool fan, as it mostly concentrates on his time at Anfield. Got loads of Retro Football programmes in the unit, but as this one was damaged, I've framed the front cover of this West Ham programme, which makes a unique picture to hang up anywhere. 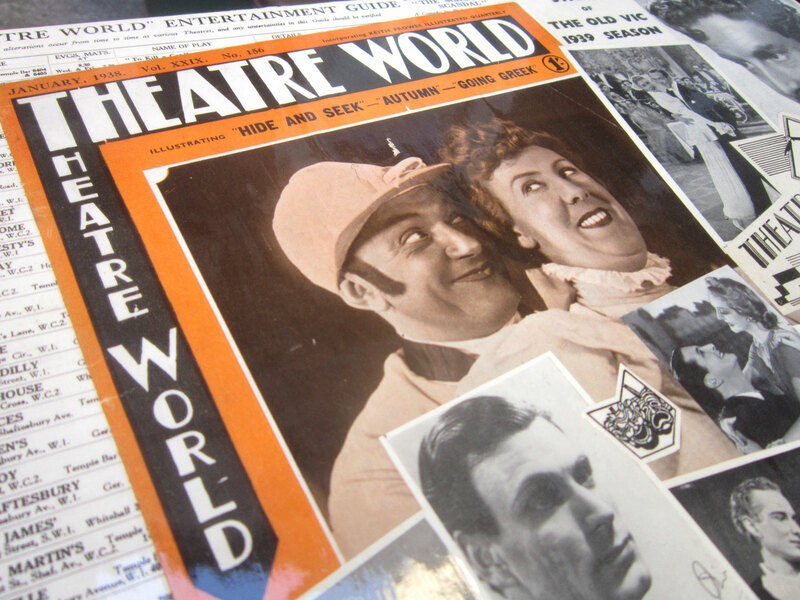 One of the brilliantly stylish Theatre World magazines, all dating from the late 1930s. They are a bargain £2-50 each, as they are quite hard to find these days. 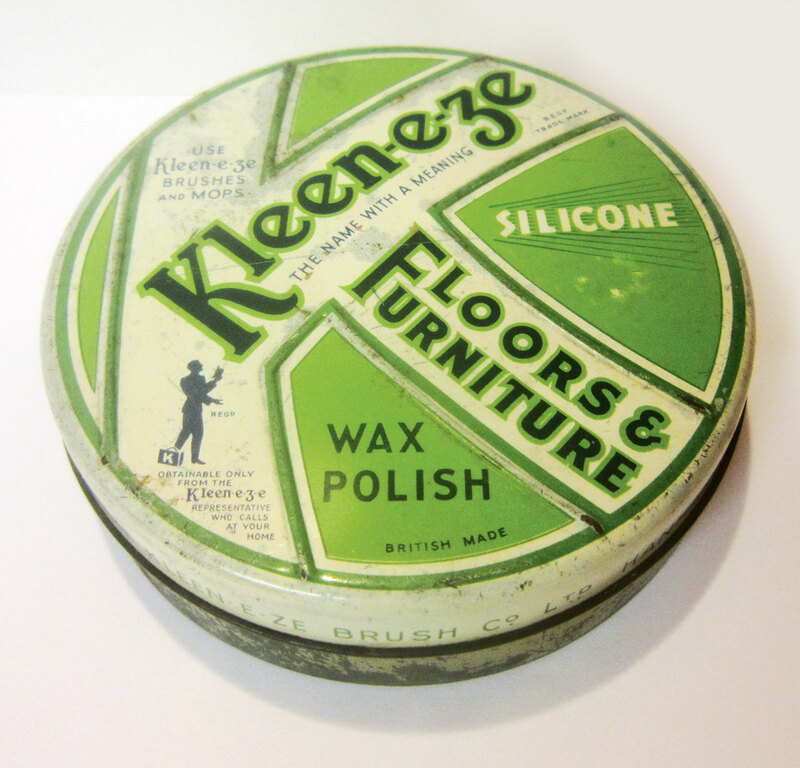 Lovely tin dating from the 1920s-30s, handy for storing any bits or spare change. 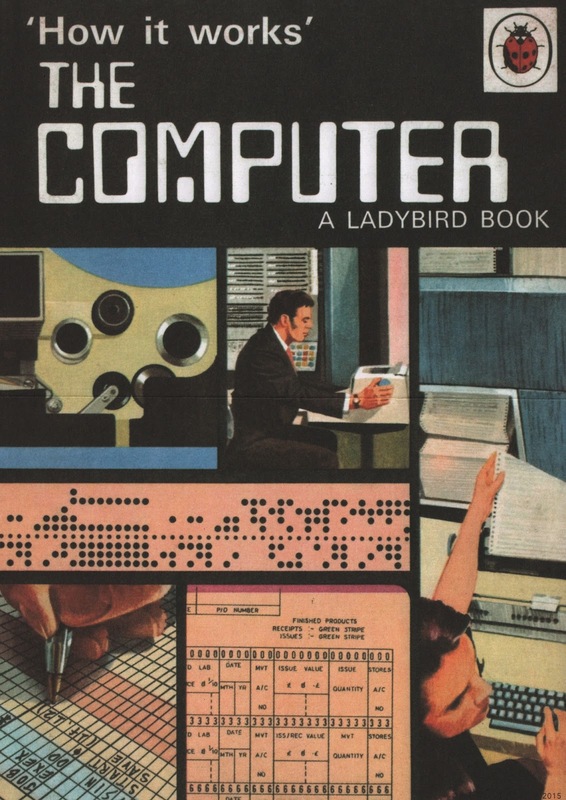 Got some A4 framed pictures of prints featuring covers from the classic Ladybird book series from the 1960s and 1970s. This brilliant cover dates from 1971. 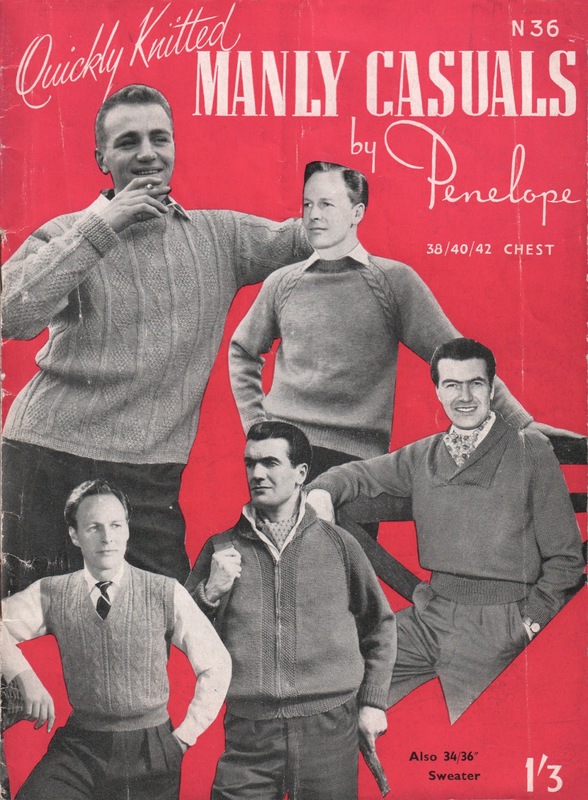 Mad 1950s knitting patterns pamphlet called MANLY CASUALS!!! This is fantastic, an original promotional brochure for the classic 1964 film My Fair Lady. 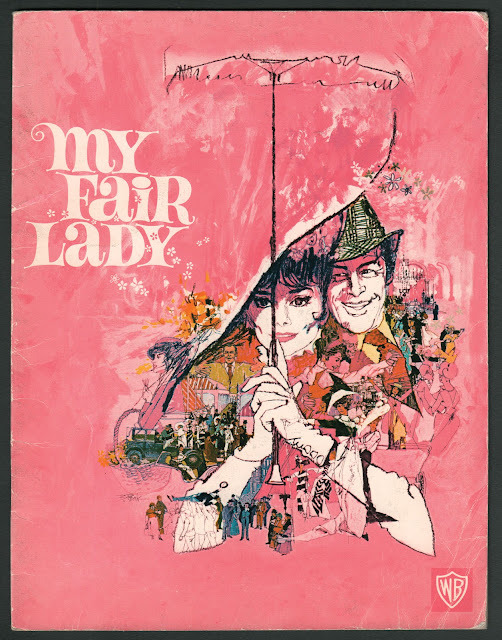 It has loads of amazing photos of the film, which starred Audrey Hepburn and Rex Harrison, and some of the sumptuous costumes designed by Cecil Beaton. 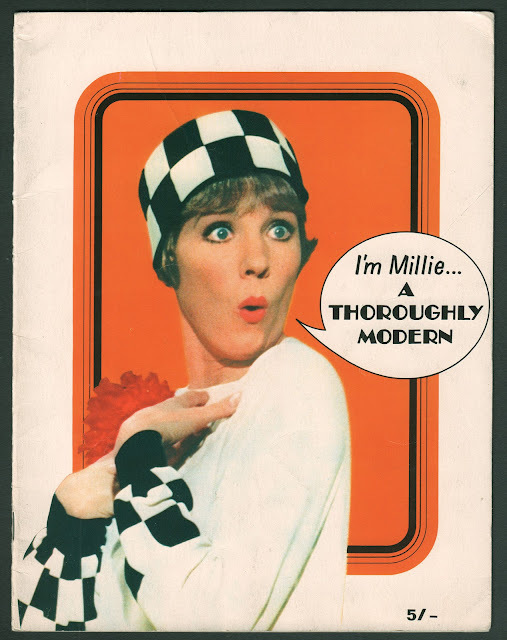 Another promotional brochure, this time for the 1967 film Thoroughly Modern Millie, starring Julie Andrews. In this musical she played a flapper in 1920s New York. So get yourself down to West Bay now and do your Christmas shopping!!! I've finished the cabinet I've been working on recently! 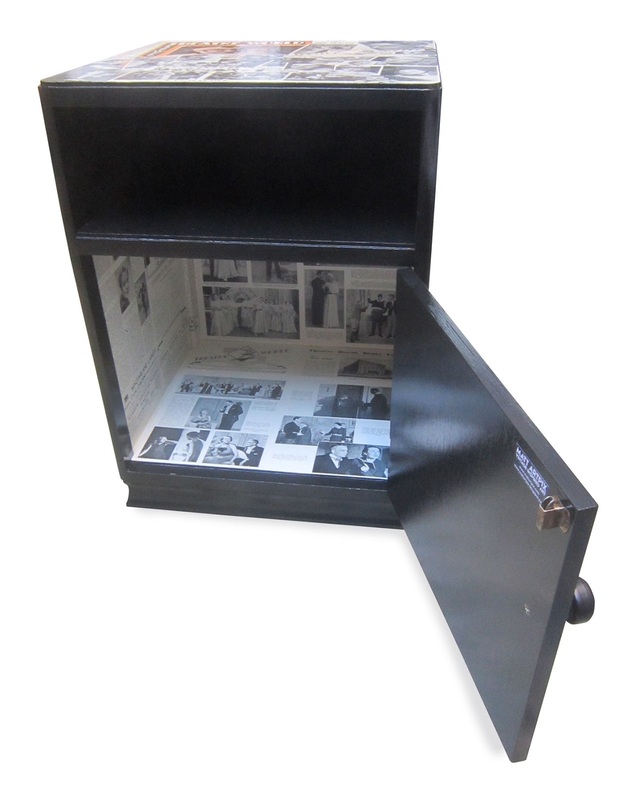 I picked up the modest 1930s cabinet at Shepton Mallet Flea Market and have transformed it into a delightful Art Deco collector's piece!!! 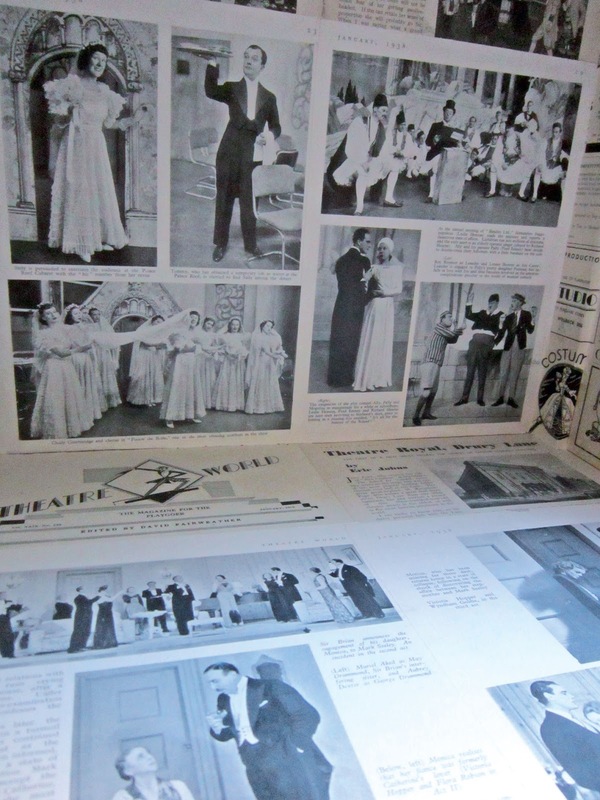 It is decorated with original pages from the lovely magazine THEATRE WORLD. 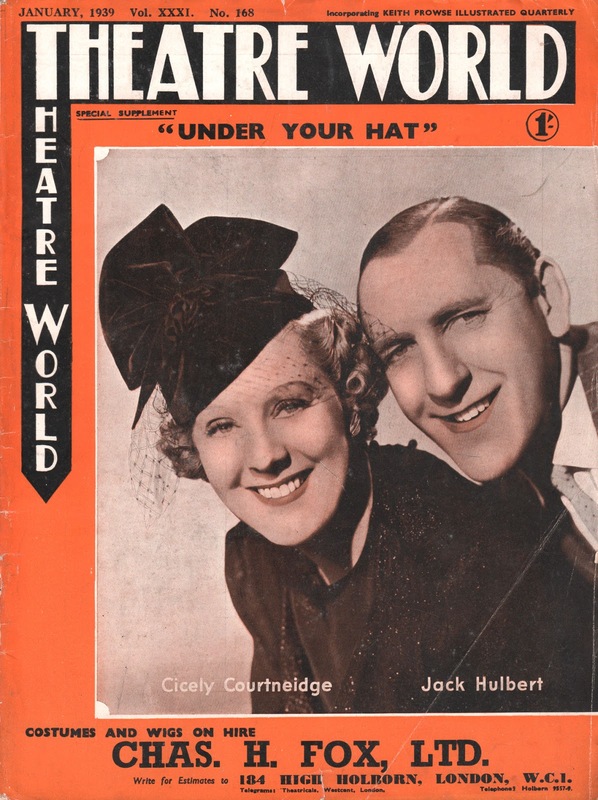 The issue I used was from January 1938 and is packed with iconic names from the stage and screen. 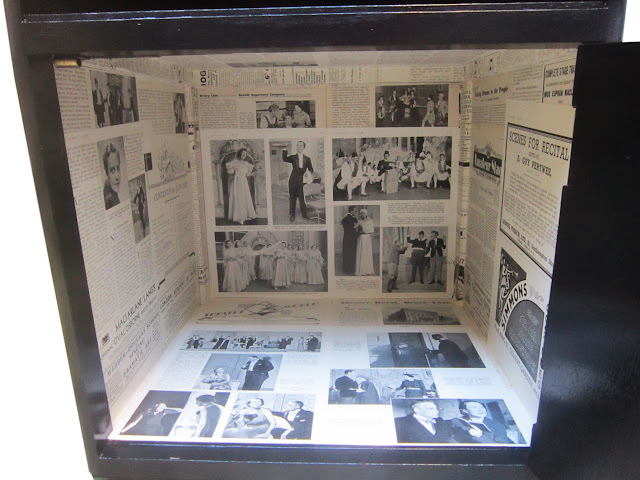 A closer look at the collage on top of the cabinet. The fantastic cover features Bobby Howes and Cicely Courtneidge. 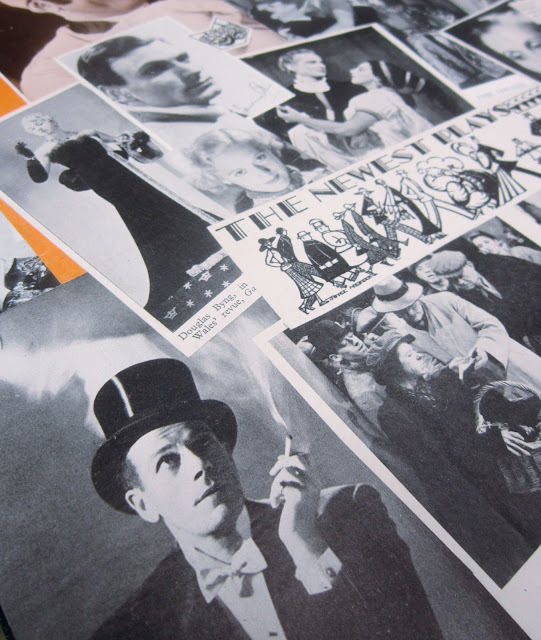 Laurence Olivier, Robert Donat and Ivor Novello are amongst the other stars. 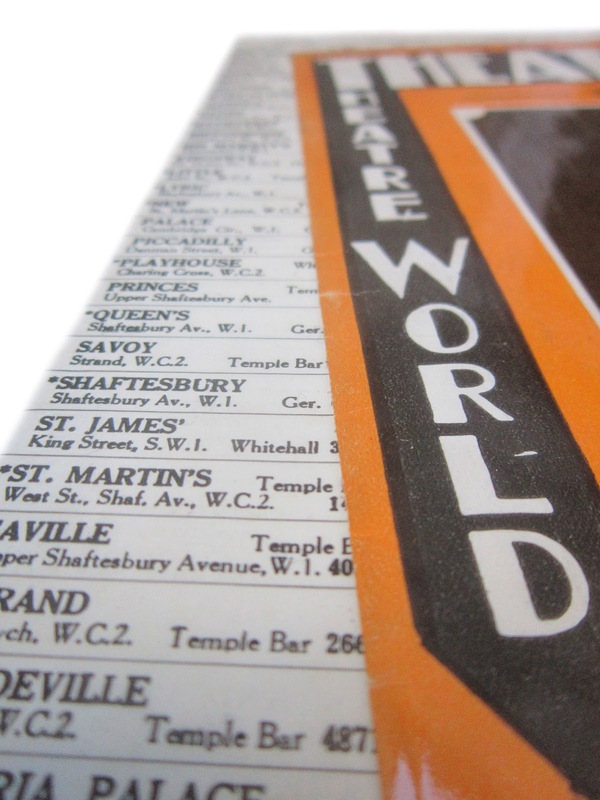 Here is a list of all London's West End theatres. A very dapper Cyril Ritchard enjoying a crafty fag! 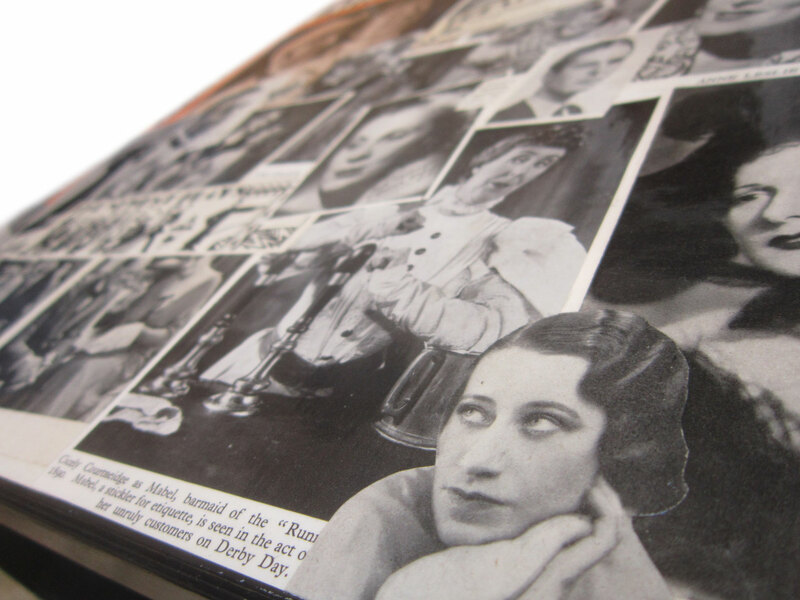 An impossibly young-looking Flora Robson keeps an eye on things. 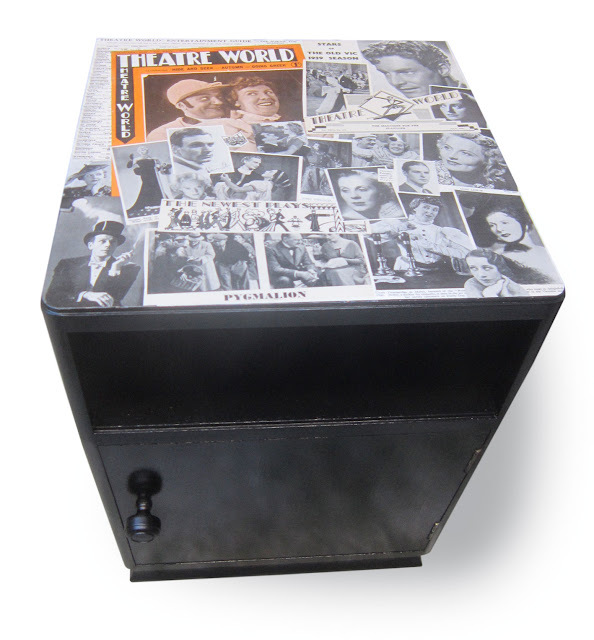 Theatre legend Terence Rattigan is in the middle of this section. Painted in a stylish black, this piece of furniture could be used as a bedside cabinet or in a lounge to store all your favourite vintage magazines. You can then place a gorgeous antique Art Deco lamp on it, or of course your cocktail glass! 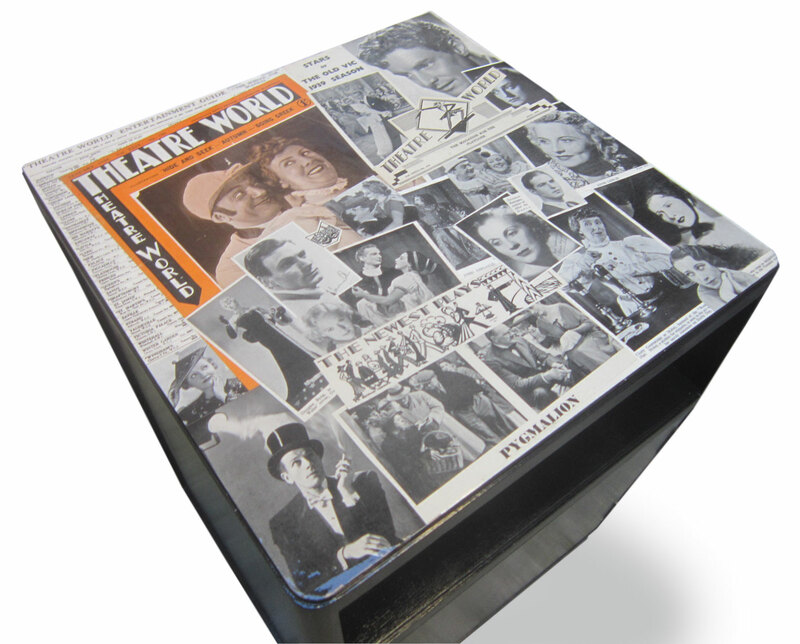 Take a look inside and you'll see I've decorated it with more pages of THEATRE WORLD! 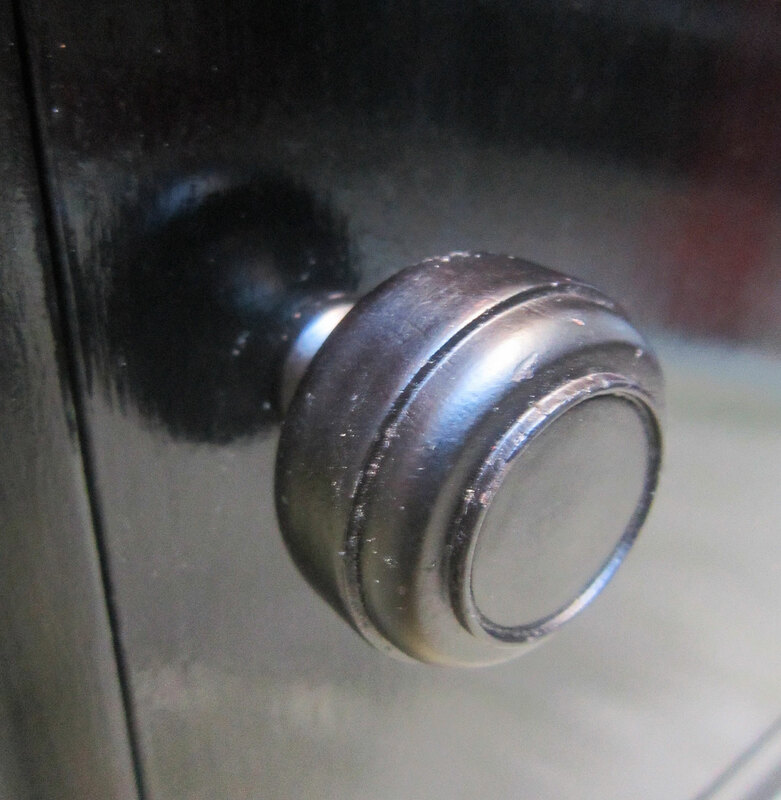 The final touch was to source an original 1930s doorknob to replace the one which was on there, as I didn't like it. I wanted a more stylish one! Finally I found one in Bridport's street market! Let me know if you would like this cabinet, as its for sale! It would make an amazingly unique Xmas pressie!! In my unit at The Customs House in West Bay, Dorset you'll find a fantastic stash of football programmes from the 70s to the 90s. 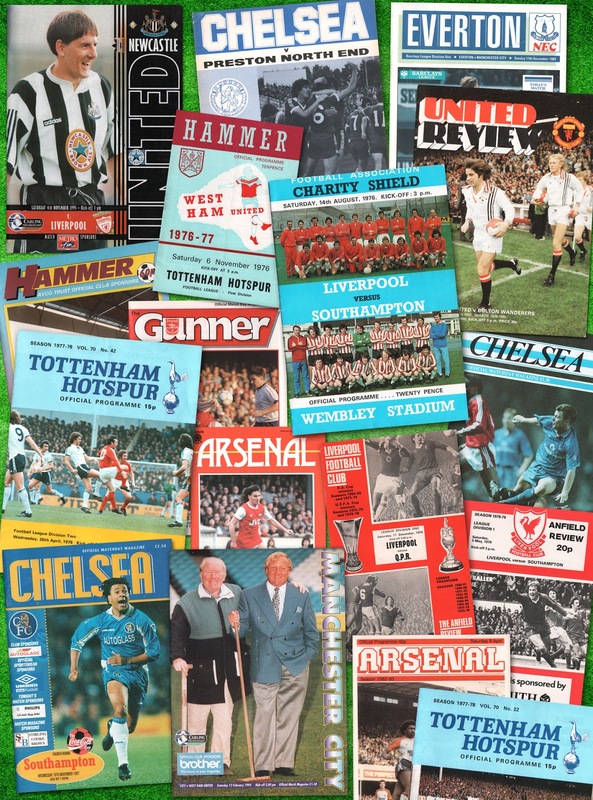 I've dug them out of the ArtPix Archives as handy Christmas pressie ideas for any footie fans you may know!! The featured teams are ARSENAL, CHELSEA, EVERTON, LIVERPOOL, MANCHESTER CITY, MANCHESTER UNITED, NEWCASTLE, TOTTENHAM and WEST HAM. They are nicely presented in individual plastic sleeves and on the back I've given you the result of the match, plus a few details and facts about the game. All are an absolute snip at only £2 each!! A rare brochure on Southampton's legend Mike Channon. 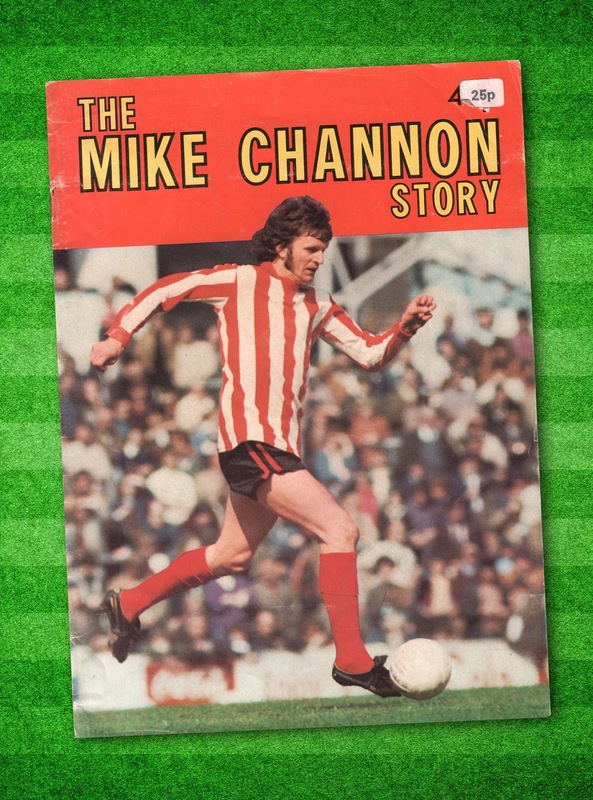 Produced in 1975, it shows the striker's story so far. He went on to lift the FA Cup with the Saints the following year. 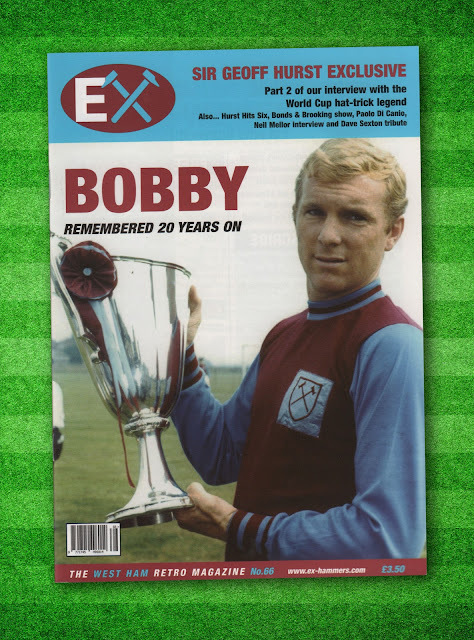 And a copy of the retro West Ham fanzine EX. Featuring the ultimate Hammers hero Bobby Moore on the cover, clutching the European Cup Winners Cup trophy which they won in 1965. A glimmer of optimism for English footie fans could be on the horizon, as the kids shone in our recent friendlies with Germany and Brazil. 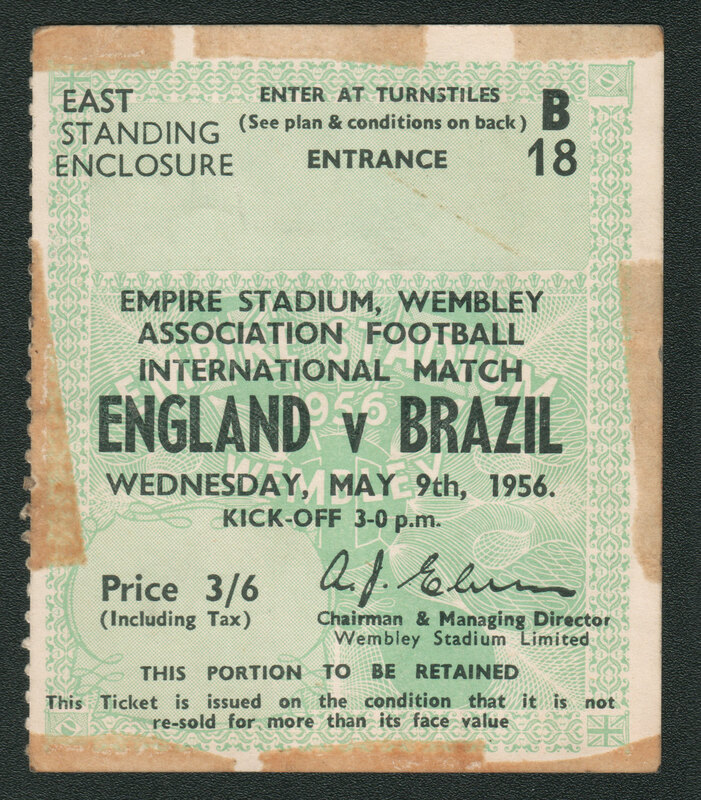 Have a look below at this fantastic original match ticket from another encounter with Brazil in 1956. 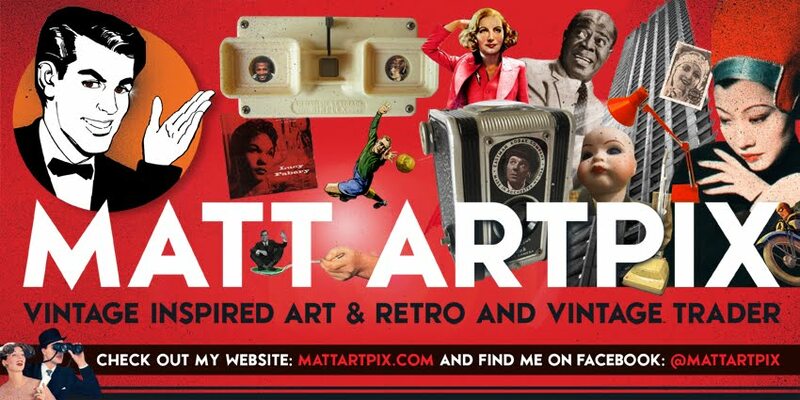 This is from the ArtPix Archives and will be on sale soon!! Wembley was packed to the rafters as 97,000 turned up to see some of England's most famous players take on the Brazilians. The team sheet included the magnificent Stanley Matthews, Billy Wright and Johnny Haynes. 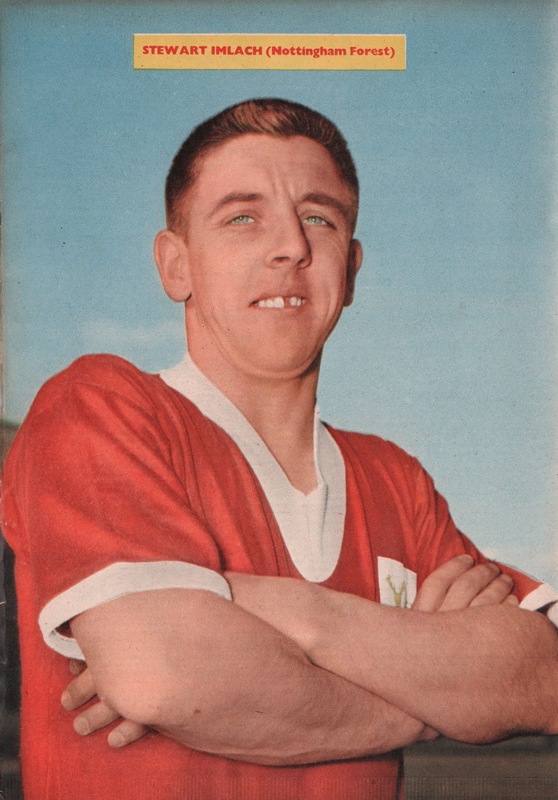 Manchester United's Tommy Taylor and Colin Grainger of Sheffield United both grabbed two goals as the home side triumphed. 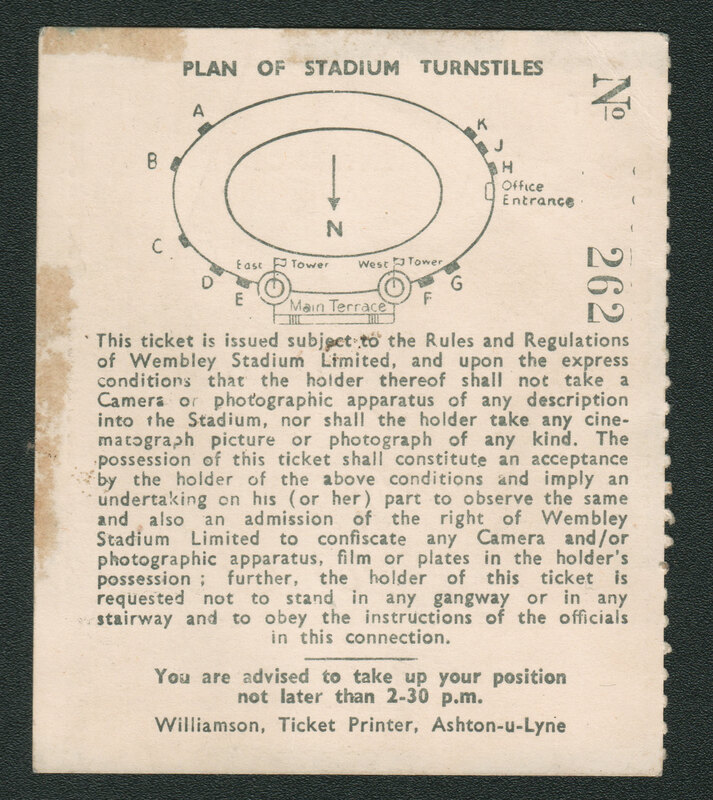 Taking a closer look at the ticket, it appears that although the match was on a Wednesday, it kicked off at 3pm. 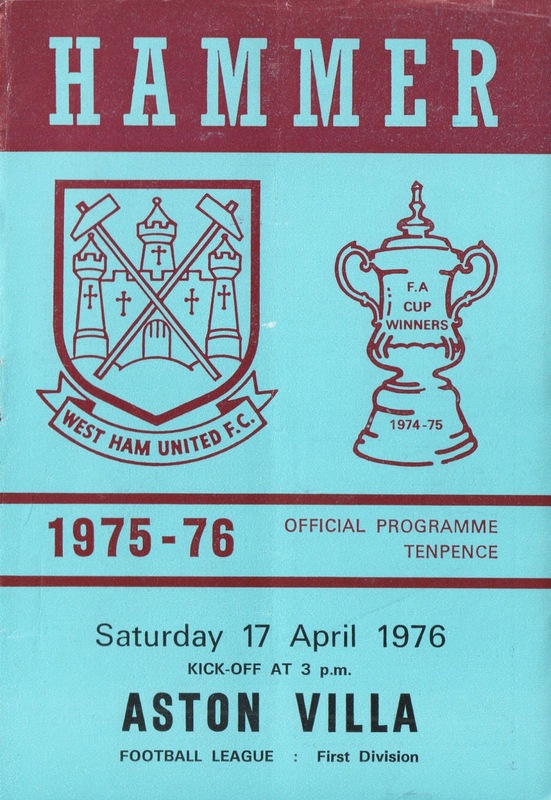 I imagine quite a lot of the crowd had sneakily phoned in sick that day to get to the game!! The price of 3/6 is roughly, according to one website, £6-16p in today's money, peanuts for a top game like that. However the match is tinged with sadness, as three of the team that day would be killed by the Munich Air Crash less than 2 years later on 6th February 1958. The Manchester United players Duncan Edwards, Roger Byrne and the goalscorer Tommy Taylor all lost their lives. 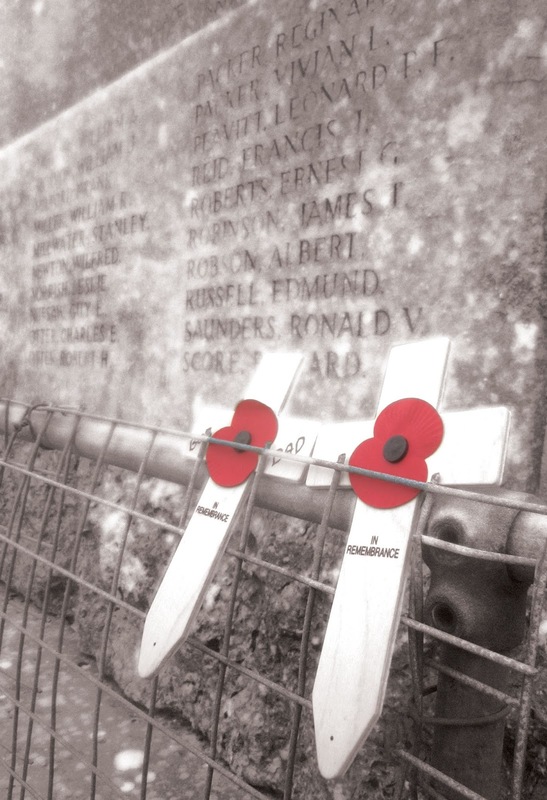 On November 11th I usually go to the Cenotaph in London to pay my respects, but this year was very different. 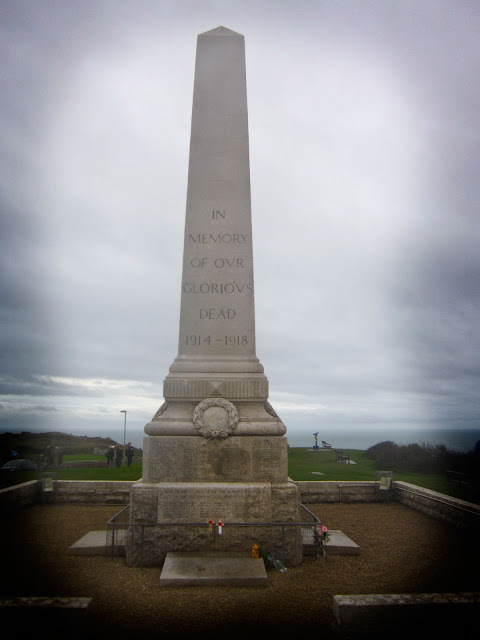 As I now live on the Isle of Portland, I today went along to my local War Memorial at the top of the hill on Portland. It is a stunning location, with sweeping views across Chesil Beach and the Jurassic Coast. The dark and threatening skies and howling wind added to the dramatic feel of the moment. And just like in London, when the whole of Whitehall falls silent at 11am, the small troop of people huddled around the huge obelix of Portland stone perfectly observed the two minute silence. 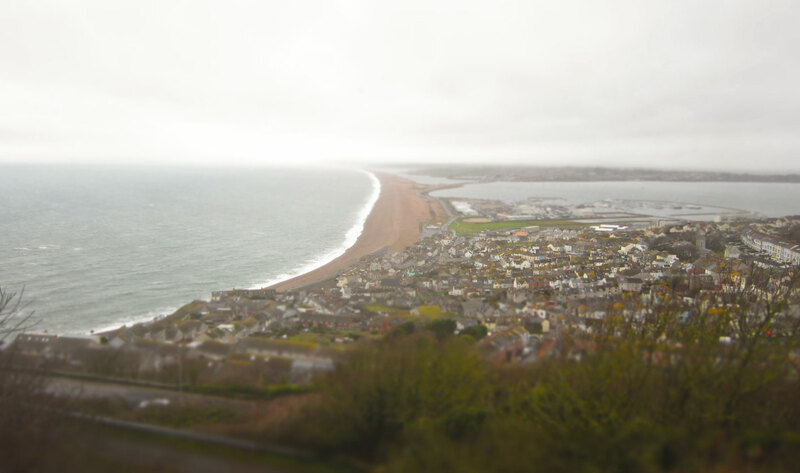 The amazing view from the memorial. 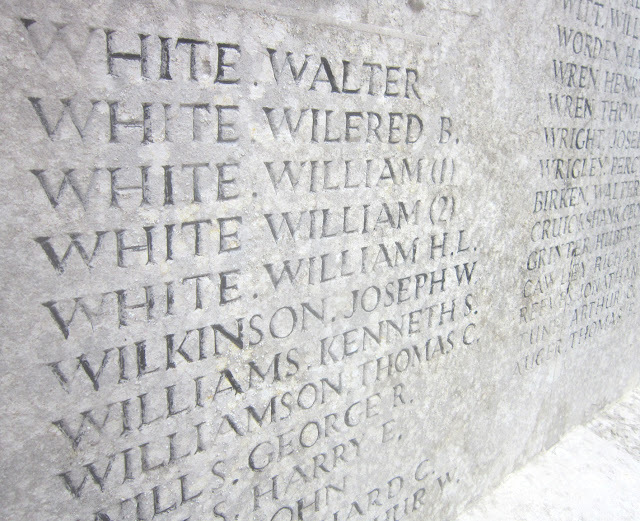 Just some of the names inscribed on the side of the obelix. I always like to finish with a Siegfried Sassoon poem on November 11th, and as we are still acknowledging the centenary of all the major events of the First World War, here is one of his poems entitled Two Hundred Years After. This is my tribute to the French in the First World War. 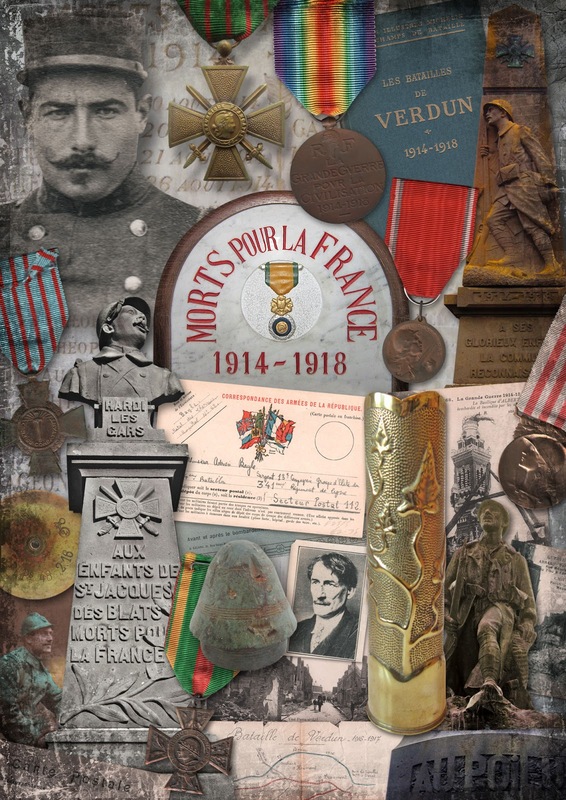 Having visited France many times and picked up various bits and pieces, I've always wanted to create an artwork to commemorate the country's experience of the war. All the images used are drawn entirely from my own collections and photographs. The war rocked France, and as their territory was being invaded in 1914 they learnt bitter lessons in modern warfare. Their armies were still wearing traditional red and blue uniforms as if fighting 19th Century campaigns. But they learnt fast, as the new Poilu grey/blue uniform encapsulated the spirit of stubborn resistance. 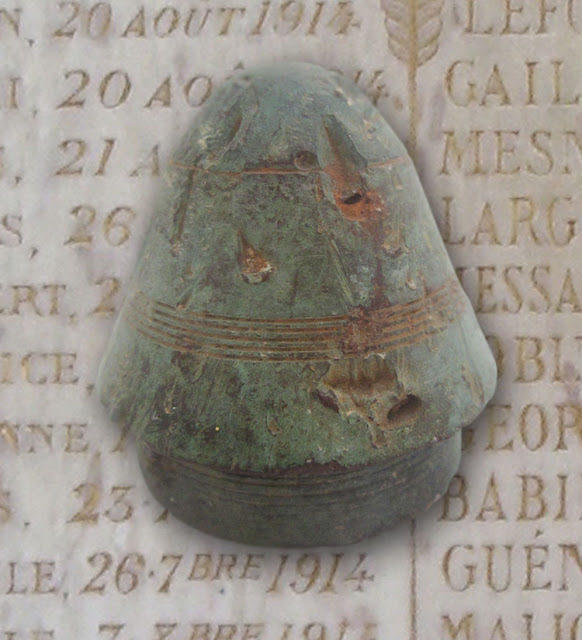 One word can define France's First World War: Verdun. The Germans attempted to capture the strategic forts on the hills in front of the town of Verdun in 1916, pinpointing the town as a symbolic part of French culture. The French resisted, but the price was incalculable. It almost destroyed the country and its army, and if anything sums up the folly and utterly senseless slaughter of the war then this is it. I've read all about the battle, but I could never find the right words to describe what happened to the people involved. Whenever I go to France I think of Verdun and I'm gripped with sadness. It was worse than the Somme and Passchendaele and had catastrophic implications when France was invaded again in 1940. For this collage I've gathered together various pieces that I've either bought in France or over here. I have quite a few medals and postcards and a few unusual bits. 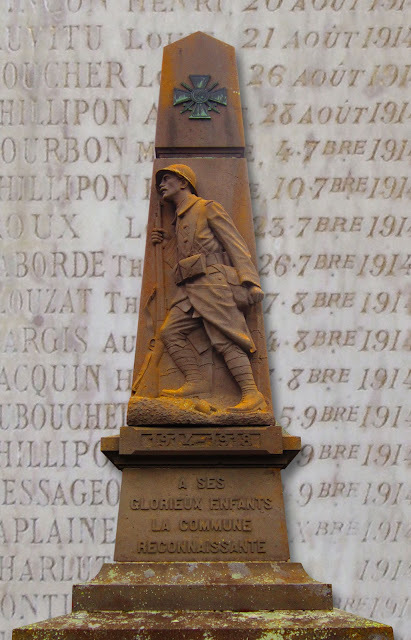 I've also trawled through my photos to find the many French war memorials I've seen in towns and villages. I've noticed their memorials can be striking and bold. Often featuring defiant soldiers, with heads held high, they are artistically much more inventive than our own. Inside churches, they also have colourful and elaborate plaques and memorials. I'm very pleased to finally have put this together, especially in time for Armistice Day. Have a look below for a few of the items that I've used. 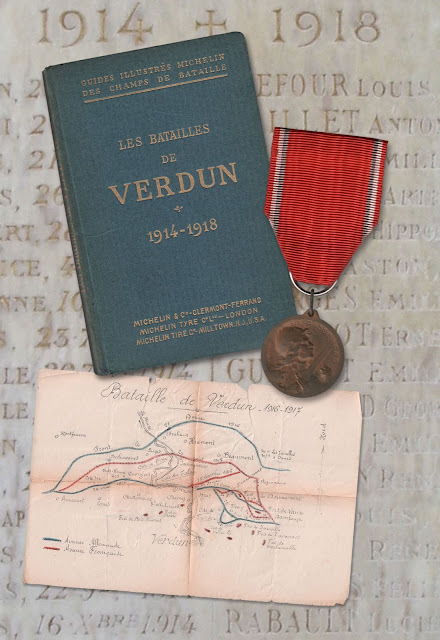 Items related to the Battle of Verdun. The Michelin guide book to the battlefield sites from 1921. Inside I found this map showing where the forts and the front lines were. Amazingly the person who owned the book would have picked up this map while touring the area, a lovely authentic touch. The medal is The Verdun Medal, an unofficial medal initially awarded to the soldiers who served there. 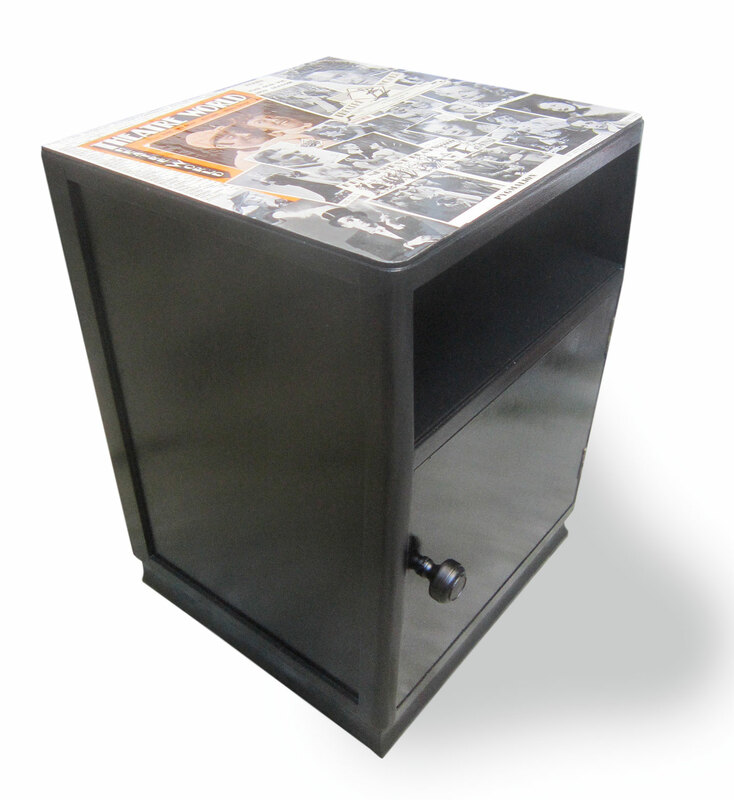 There are seven different versions, but this is the 1st issue by Vernier. 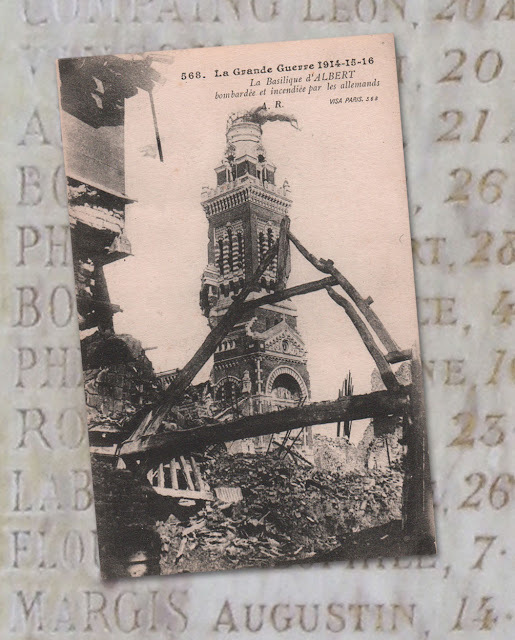 An original postcard of the basilica in the French town of Albert, which was behind the lines of the Somme battlefields. In 1915 the golden statue of Mary on top of the building was hit by a German shell and got stuck in this position. Legend soon sprung up that if it fell off the war would end. 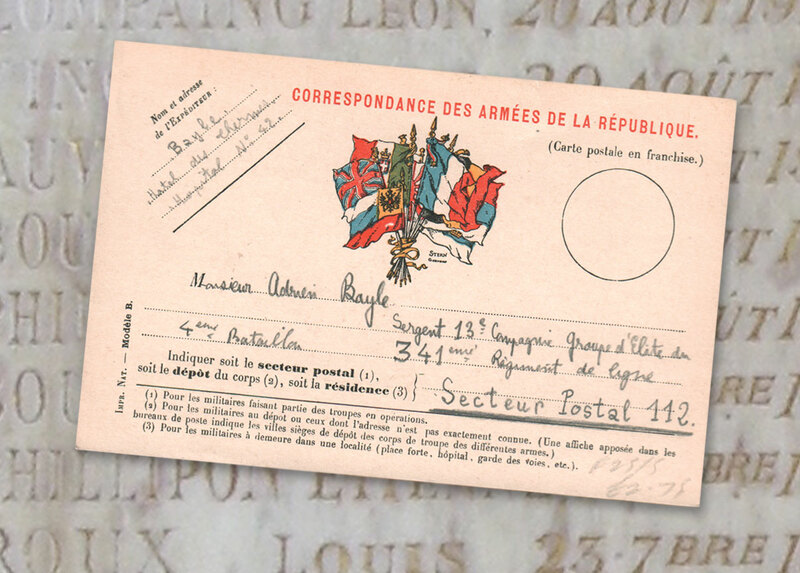 It finally went in April 1918, but the war would go on another seven months. A rare French army postcard. Sent to a Monsieur Adrien Bayle, presumably by a relative who was in a hospital. Henri Barbusse. 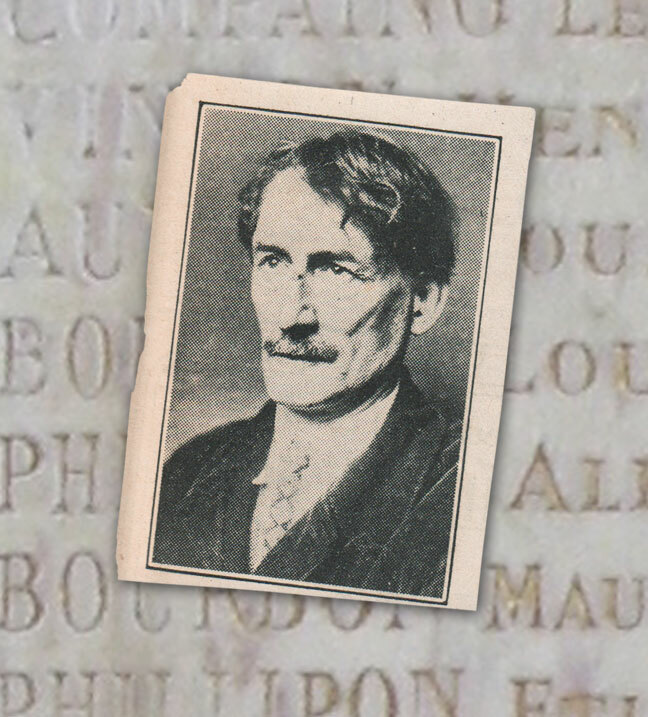 The French author who wrote the famous book Le Feu (Under Fire) in 1916. 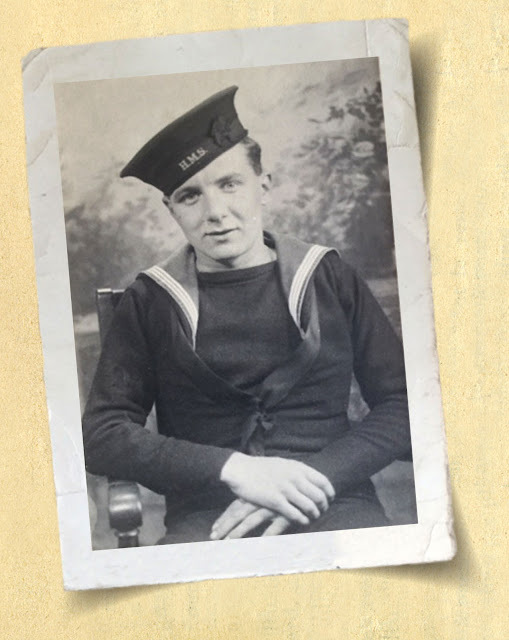 Having joined up aged 41, he served for 17 months and endured all war could bring, thus writing his enraged and detailed account. Although this shell fuse is British, it was dug up from the Western Front in France. The 'iron harvest' is still a common sight on the battlefields. 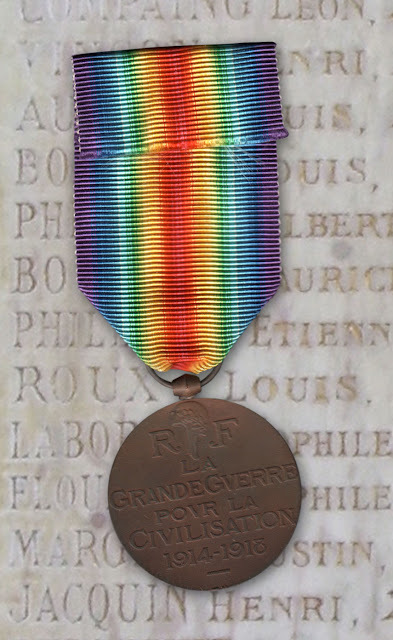 The French Victory Medal. All the Allies awarded their soldiers one of these and each country had their own version. This is the reverse of France's medal. An example of a striking French war memorial, time hasn't weathered this defiant Poilu. The image of the soldier I've used in this artwork, was from a tiny photograph I picked up in a brocante fair in Auvergne last year. I've done a little bit of research on it, which I'll share with you another day, watch this space!